A free agent mentor is defined as a “short term” employee who transfers their knowledge to other employees through a formalized corporate mentoring program. Free agent mentors allow you to retain practical skills and abilities as “employee” retention becomes more difficult. There is a troubling disconnect today between the mindset of top talent and employer expectations. Modern employees, especially those from Generation X & Y, don't want to stay at their jobs forever. In a study by Harris Interactive, it was found that one out of every five employees planned on changing jobs in 2014. Younger generations want the freedom to experience different job roles, but employers are slow to embrace the idea that creating HR systems and processes of retention isn’t enough to help them attract and keep top talent. Today's irresistible organizations, the ones that attract the best and brightest of the workforce, embrace career mobility and diversified learning programs. They are transparent about their intentions and expectations for every employee. The irresistible organization operates on a free agency model, where talent is brought in on a contract basis to do a specific job, usually within a defined timeframe. While most companies struggle to retain talent, these irresistible organizations are recognizing that much of their top talent will only be around temporarily, whether they like it or not. With a focus on transferring the knowledge of “free agents” to their more long-term employees through formalized mentorship programs, these organizations retain the skills and abilities that would otherwise be lost with the departure of the employee. 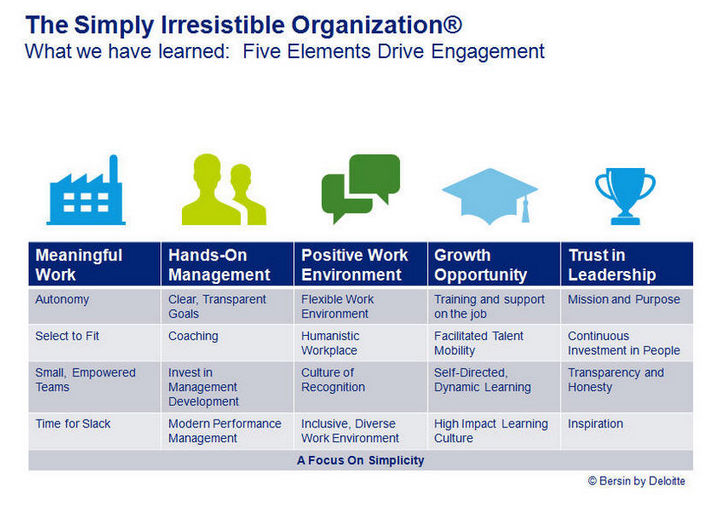 Image Credit: Josh Bersin Why People Management is Replacing Talent Management. With the recent shifts in employee mindset, “growth opportunities” might be the most important element of this framework to focus on as the first step to creating a more “transparent” and attractive culture. Clearly promote career mobility. Don't try to hide the elephant in the room: you need to make it known to your employees that above all, you are invested in their success, even if it comes outside of the organization. Mentoring programs provide employees with the opportunity to develop their skills in ways that prepare them for the career path of their choosing. Create a culture of learning. Since employees may not stay very long, it's even more important that the rest of your team learns what they can from each other. A well-planned mentoring program is the perfect way to ensure that skills are transferred throughout the organization. If you can’t retain the talent, you can at least retain the skills. Establish long-term relationships. When your best performers leave, they shouldn't drop off your radar. Fostering a strong alumni network can help you fill vacant roles more quickly, improve brand advocacy, and support business development. Make sure that you continue to engage with top talent, even after they leave the company. Insala's corporate alumni software is an excellent tool for this. Your company is already a part of the free agency model. The decision was made for you by today's pool of talent, which has already shown a willingness to change jobs more frequently than previous generations. The more pressing issue is what to do about it. If you aren't creating a workplace culture that is sensitive to this shift, you will struggle to attract and retain the best employees. The key is not to push back against the free agency model, but to embrace it by improving the way knowledge is transferred through mentoring in your workplace. For more information about the latest trends in the exchange of knowledge in the workplace, download Insala's 2015 Mentoring Benchmarking Survey Report.